As a graduate of Ambers Academy of Pet Styling, Valerie received professional training by Master certified groomer Amber Lewin. Valerie has gained much knowledge and hands on experience when it comes to pet grooming and styling. She is IPG certified (International Professional Groomer) and pet CPR certified as well. She is very loving and caring towards all her clients’ animals and you can be assured your baby is in good hands. Her passion for animals goes back to her childhood, having owned a variety of animals herself. From bunnies and horses to cats and dogs, she’s loved them all. She started at a young age washing dogs over her summer breaks with her cousin Amber. Valerie has always had a place in her heart for animals. 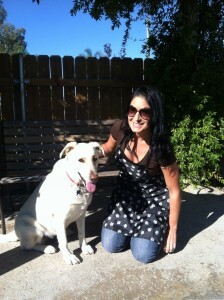 On a mission to do what she loves, Valerie decided to dedicate her future to working with animals on a fulltime basis. Serving most of San Diego County, she is ready to meet your 4 legged family members and give them the best service possible. Valerie prides herself on providing professional and prompt service to each and every client. With a background in business, Valerie understands the value of customer service and meeting each clients needs. Whether you’re at home or away, like many clients are, we can make the proper arrangements to make sure your pet grooming needs are met.